﻿ RealPlayer to AVI - How to convert Real Player to AVI on Windows/Mac? Home » video » How to Convert Real Player to AVI? Sometimes you downloaded funny and interesting videos from RealPlayer or record live streams from the Web by RealPlayer and want to convert RealPlayer to AVI, HD AVI, DivX AVI, or XviD AVI. It is annoying thing that the RealPlayer cannot convert RealPlayer movie to AVI. In such cases, you will need another video converter to convert Real Player to AVI. 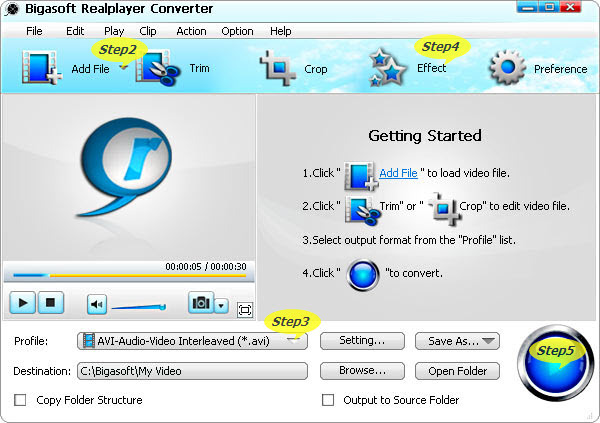 This article introduces a powerful RealPlayer to AVI Converter, Bigasoft RealPlayer Converter and guides you on how to use Bigasoft RealPlayer Converter step by step to convert RealPlayer files to AVI. Free download Bigasoft RealPlayer Converter (Windows Version, Mac Version), install and launch it. Real Player Converter is outstanding RealPlayer to AVI Converter that is capable of converting RealPlayer files in RM, RMVB, and RV. It can fast convert Real Player video to AVI, HD AVI and convert RealPlayer to Wii, Xbox, PS3 DivX video AVI, PS3 DivX HD video AVI, Creative Zen XviD video AVI, iRiver XviD video AVI, BlackBerry AVI Video, Xvid video AVI and smart TV DivX Video AVI. Besides converting RealPlayer to AVI, RealPlayer Converter can also convert real media to various video and audio formats. Real Player Converter is also powered with a smart video editor which allows you to trim, crop, merge videos, adjust the parameters, video effects to customize output effect, capture pictures, add subtitles, watermark and more. Click "Add File" to add RealVideo files. Or first locate the Real videos, then drag and drop them to RealPlayer to AVI Converter. Click "Profile" Dropdown List, and choose "AVI - Audio Video Interleaved (*.avi)" or any desired profiles like HD AVI Video, PS3 DivX HD video AVI and so on. Click "Effect" in the main menu, you will realize to trim Real video to keep the excellent part, crop video to focus area, add watermark and subtitles and so on. Now everything is set. Just Press the big blue convert button to start converting RealPlayer to AVI. 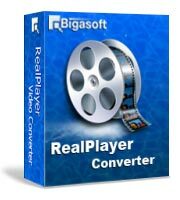 Bigasoft RealPlayer Converter will batch convert all your files extremely fast with high video and audio quality. After the conversion is done, simply click "Open Folder" to fast locate the converted files. With the help of Bigasoft RealPlayer to AVI Converter, it is so easy to convert RealPlayer to AVI, no matter what format the files are. RM, RV, or RMVB video format, all can be converted to AVI fast and easily. Just go on do and enjoy it.